NEW YORK, Dec. 1, 2014 – The minimal and modern Euphoria shower system from GROHE, the world’s leading manufacturer of premium bathroom and kitchen faucets and fittings, illustrates key trends in the US marketplace. The design wields perfect proportions and uniform geometry, an aesthetic that complements contemporary bathrooms or adds a modern touch to traditional bathrooms. 1. Exposed Valves: “Exposed valves have always been the norm in Europe; now in the U.S, it is not only a design statement but makes for less expensive construction,” said Ben Fix, Director, Product Marketing and Training, GROHE America. 2. Personalized Spa Experience: GROHE products are featured in the finest luxury hotels in the world – from The St. Regis Bali to the W Barcelona The spa experience comes home with the Euphoria system, equipped with the brand’s proprietary GROHE DreamSpray® technology, providing perfect water distribution through every single nozzle in the “Rain” spray pattern – identified by extensive consumer research as the most used and appreciated of all available spray patterns. The head shower can be swiveled to the optimal position for that truly individual shower experience. The biggest benefits are provided by GROHE’s unique technologies. The Euphoria System is a combination of modern, contemporary design and functional excellence – uniting GROHE DreamSpray® and GROHE TurboStat® in one product. The system delivers all the benefits of a fully customized system, including a thermostatic, head shower and hand shower for greater showering comfort and a superior overall experience. 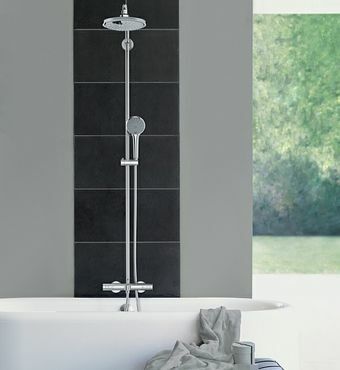 Finally with GROHE StarLight® the chrome finish is guaranteed to retain its splendid sheen for many years. Euphoria innovations from GROHE – access a new world of showering enjoyment! The GROHE Group is the world’s leading provider of sanitary fittings, comprises Grohe AG, Hemer;Joyou AG, Hamburg and other subsidiaries in foreign markets. With its global GROHE brand, the GROHE Group relies on its brand values quality, technology, design and responsibility to deliver “Pure Freudean Wasser”. With the JOYOU brand, the Group covers the fast growing Chinese market.